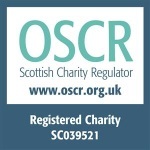 We’re committed to showing you how your donations make a difference to the lives of local children and their families. These stories demonstrate how we spend the money you raise makes an impact. We’d love to show you the impact you’re making when you donate to The ARCHIE Foundation. Your money makes the difference for local sick children in lots of ways. Lets start with our Small Grants Programme. Any individual or group engaging with the NHS child health teams can apply for a grant of up to £500. We have a set of criteria these applications have to meet in order to be approved and a decision is usually made within 48 hours. The little things truly are the big things. Thank you. Here’s a story to give you a warm and festive Friday feeling! 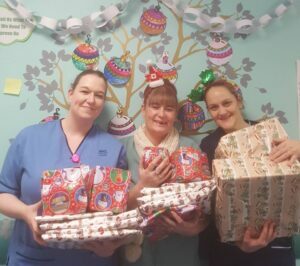 Your donations have provided the Homecare team at RACH with a bumper pile of presents to deliver to the children they visit. With your money we have bought special toys for the children, who have complex needs. Our picture shows Kim Scott, Claire Hume and Mhairi Stephen from the Homecare Team. Kindness is everything. Thank you. 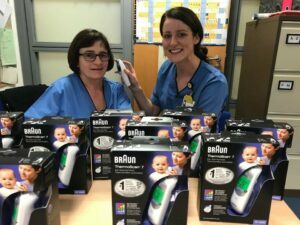 Donations from our supporters have funded 10 super precise thermometers for the oncology department at RACH this month. Nurses at the department can now give these to parents of children treated in oncology to use at home, providing much-needed peace of mind. We say it a lot at ARCHIE, but little things really do make the difference – thank you.